Are you looking to achieve Open Group certification and become a certified professional? We have good news for you; we have a solution, which can help you clear the Open Group certification. We are here to assist you in achieving your goal by using our online certification practice exam platform. 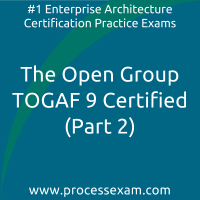 With tons of experience in the field of Enterprise Architecture, our team of expert has designed these practice exams which simulate actual Open Group certification exam environment. We recommend you to use our online Open Group certification practice exams for your test preparation. These practice exams will help you to validate your knowledge and identify the areas which need improvement, it will make you familiar with Open Group certification exam pattern and question format. The Open Group certification enhance your skills and knowledge by exposing you to real-time business scenarios and case studies. The most important value Open Group certification adds into your career is the endorsement from the Open Group that says you know what you are doing. I had enrolled with Processexam.com for TOGAF9 level 2 certification. All Questions provided was very good and i found similar questions in my actual exam. 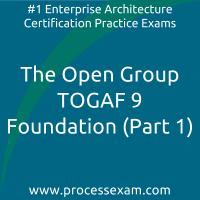 I cleared TOGAF Foundation Cerification, Thanks to PROCESSEXAM.COM, for the practise set questions. Guys I will suggest everyone to go ahead with this exam and do the set of premimum exams. You will definitely get benefits from practicing regularly here. 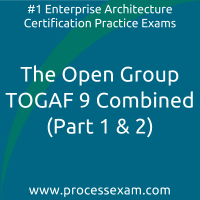 2 months are more than enough to clear TOGAF Certified. I got the advantage of 2 months unlimited access on processexam. I used it to the fullest by giving practice tests regularly. As i was serious and involved, it was enough for me and also helped me score 87%. I thank my colleague for directing me to processexam paid OG0-091 mock tests. My score is 70% in TOGAF9 Foundation. Loads of feature are quite helpful. I never gave up even when i secured low marks in the mock tests here for TOGAF 9 Foundation - Level 1 exam. I prepared hard and received 79% in the actual exam. The site has a fabulous questions bank for TOGAF9 exam.